The moonroof will only operate when the ignition switch is placed in the ON position. The moonroof is operational for a period of time, even if the ignition switch is placed in the ACC (if so equipped) or OFF position. If the driver’s door or the front passenger’s door is opened during this period of time, the power to the moonroof is canceled. To fully open or close the moonroof, push the switch to the open 1 or close 2 position and release it; it need not be held. The roof will automatically open or close all the way. To stop the roof, push the switch once more while it is opening or closing. To tilt up, first close the moonroof, then push the switch to the tilt up position 1 and release it; it need not be held. To tilt down the moonroof, push the switch to the tilt down position 2 . The auto-reverse function can be activated when the moonroof is closed or tilted down by automatic operation when the ignition switch is placed in the ON position or for a period of time after the ignition switch is placed in the OFF position. Depending on the environment or driving conditions, the auto-reverse function may be activated if an impact or load similar to something being caught in the moonroof occurs. There are some small distances immediately before the closed position which cannot be detected. Make sure that all passengers have their hands, etc., inside the vehicle before closing the moonroof. If the control unit detects something caught in the moonroof as it moves to the front, the moonroof will immediately open backward. If the control unit detects something caught in the moonroof as it tilts down, the moonroof will immediately tilt up. If the auto-reverse function malfunctions and repeats opening or tilting up the moonroof, keep pushing the tilt down switch within 5 seconds after it happens; the moonroof will fully close gradually. Make sure nothing is caught in the moonroof. In an accident you could be thrown from the vehicle through an open moonroof. Always use seat belts and child restraints. Do not allow anyone to stand up or extend any portion of their body out of the moonroof opening while the vehicle is in motion or while the moonroof is closing. Remove water drops, snow, ice or sand from the moonroof before opening. Do not place heavy objects on the moonroof or surrounding area. The panoramic sunshade operates when the ignition switch is in theONposition. When opening or closing the sunshade the switch need not be held. 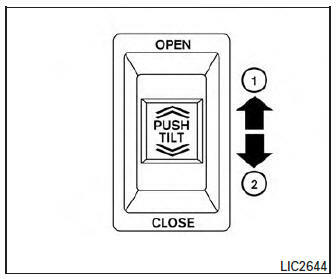 To fully open the sunshade, push the switch 1 toward the open position. To fully close the sunshade, push the switch 2 toward the close position. To avoid personal injury, keep your hands, fingers and head away from the sunshade arm, the arm rail and sunshade inlet port. Do not allow children near the rear sunshade system. They could be injured. Do not place objects on or near the rear sunshade. This could cause improper operation or damage it. Do not pull or push the rear sunshade. This could cause improper operation or damage it. Do not place objects (such as newspapers, handkerchiefs, etc.) on the sunshade inlet port. Doing so may entangle these objects in the sunshade when it is extending or retracting, causing improper operation or damage to the sunshade. Do not push the sunshade arm with your hands, etc., as this may deform it. Improper operation or damage to the sunshade may result. Do not put any object into the sunshade inlet port as this may result in improper operation or damage the sunshade. Do not hang any object on the arm rail as this may result in improper operation or damage the sunshade. Do not forcefully pull the sunshade. Doing so may elongate the sunshade. Improper operation or damage to the sunshade may result. Have your NISSAN dealer check and repair the moonroof.